The Glasgow Marathon was one of the biggest and best of the City Marathons of which there were many – in one year Scotland had 14 races over the magic distance. Glasgow had many of the biggest stars in marathon running and it was also one where home cots performed well. It is appropriate that it is examined in some depth and Joe Small has written the history of the race below. “The present day Glasgow event started life as a full marathon in 1979, prior to the advent of the people’s races, or ‘fun runs’, continuing through to 1987 as a full marathon before changing to a half marathon in 1988. What follows is a brief summary of the full marathon between those dates. 1979: The inaugural race required a qualifying time of three hours resulting in a restricted number of competitors. The race on Sunday 14th October attracted a field of 63 with 58 finishers, in stark contrast to the thousands who competed in later years. The course for that first running consisted of four laps, starting in George Square, on to Ingram Street, High Street, westward along the north bank of the Clyde to Finnieston, Argyle Street, looping round Byres Road, University Avenue, Kelvin Way, then following Sauchiehall Street back to the city centre and George Square. The runners set off in mild, slightly damp conditions, perfect for marathon running. At five miles the leaders were 1976 British Olympic Marathon representative Barry Watson (England), Sandy Keith (Scotland) and Doug Gunstone (Scotland) passing the marker in 25:49. At the ten mile point, Watson and Keith led in 52:06 with Gunstone third in 52:14. Fifteen miles saw the same three leading, Watson and Keith 1:18:27, Gunstone 1:18:56. This continued through twenty miles, 1:44:17 for Watson and Keith, Gunstone falling further behind with 1:46:40. Watson pulled away over the last six miles having a seven second lead at 25 miles, winning by 23 seconds from Keith in 2:17:45 with malcolm Firth of Wales coming through to take third from Gunstone in fourth. Leslie Watson, being the only female competitor, won with 2:53:32 taking forty sixth place. 1980: The 1980 race, on Sunday 14th September, saw the same course as the previous year being used. 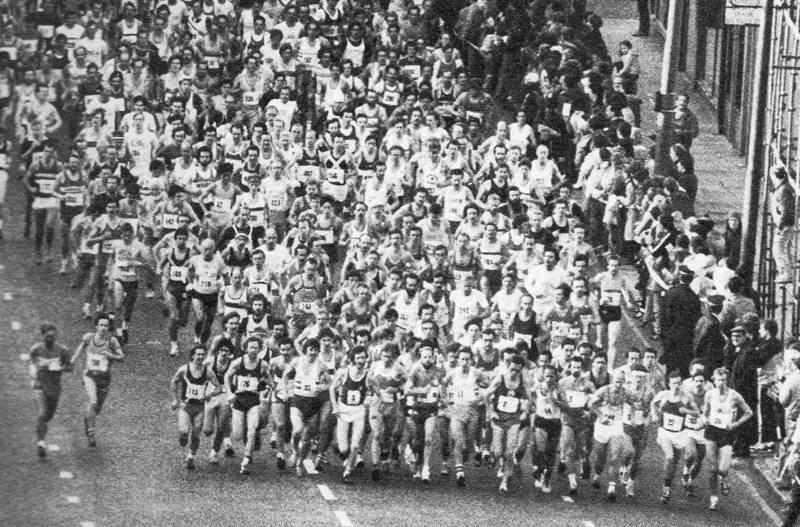 With entry requirements similar to 1979, a field of 62 runners set off from George Square. An innovation for this event was the inclusion of an international team race, with representatives from Scotland, England, N Ireland, Wales, Eire and Argentina taking part. Through five and ten miles a leading group of four set the pace, Jim Dingwall from Scotland, England’s John Cain and Alan McGhee and Steve McHale from Wales, 25:19 for five miles, 51:27 at ten. McHale had dropped 30 seconds off the pace at 15 miles, passed by the leaders in 1:17:00. By 20 miles it was down to two, Dingwall and Cain, timed at 1:42::54. Dingwall had a two second lead at 25 miles, eventually winning by nine seconds in 2:16:07 from Cain in 2:16:16. Leslie Watson again won the women’s event, finishing thirty fifth in 2:47:07. 1981: The 1981 race took place on Sunday, 18th October, with a field of 144 runners. In ideal conditions over the same city centre route, Eire’s Jim McGlynn was victorious with a winning time of 2:18:24, just outside his personal best. Second place was taken by Alan Coles from Wales, with rod Stone from Cambuslang Harriers, representing Northern Ireland, in third. Scots took the next three places, Colin Youngson fourth, Des Austin fifth and Alistair Macfarlane in sixth, giving Scotland victory in the team race. The women’s race was won by Priscilla Welch, representing Dunrossness AC, from Shetland with a time of 2:55:15 when finishing in fifty eighth place. 1982: Following on from the success of large marathons such as New York and London, the race this year was the first “Scottish People’s Marathon” with a new course taking in much of the city, starting on the Saltmarket, via George Square taking in Byres Road, Dumbarton Road, the Clydeside Expressway, the Broomielaw, Bellahouston Park, Pollok Park then through the south side and finishing at Glasgow Green. From the hundred or so starters in previous years a huge total, 7100, set out on Scotland’s first mass participation “people’s” event. American Emil Magallanes was the first to make a break, just after halfway pursued by Scotland’s Jim Brown and Peter Fleming. Magallanes fell away soon afterwards, Brown and Fleming built up a nine second lead over England’s Glenn Forster. Brown dropped away at 22 miles with Forster, in windy conditions, pulling away to win in 2:17:16; Forster’s Sunderland Harriers clubmate Calum Bark came through with a late surge to claim second place in 2:18:36 with Fleming being first Scot in third with Brown fourth. First veteran was Fife’s Donald Macgregor with 2:22:06 and marathon great Jim Alder competing in what he said was his last marathon recording an excellent 2:26:40. An interesting finisher was Olympic 1500m runner Frank Clement in 2:45. The women’s race was a repeat of the previous year with Priscilla Welch again victorious. After running with Linda Stott from Aberdeen till around the 20 mile mark Welch pulled away to win by 26 seconds from the previous winner, Leslie Watson who passed a flagging Stott in the closing stages. 1983: If 1982 had seen a massive number of participants, this year saw even more. From an entry of 14000, 9606 started, with 9600 finishing, putting Glasgow in the top league of ‘Big City’ marathons. One of the problems with dealing with such large numbers cropped up in this event, when there was an issue with obtaining medals which were to be handed out the finishers as they crossed the line. Due to manufacturing difficulties, only the first three finishers in the men’s & women’s events together with the winners in the vets categories received a medal, everyone else had to settle for a rose! 1984: The 30th September saw this year’s event take place, with again, an increase in the number of participants – a new record total 10173 lined up for the start, with 9449 finishing. Amazingly, over 5000 other entrants failed to show up. A very fast start to the race saw the leaders, including Jim Brown, Alistair Douglas and Jim Warwick open up a 10 sec. lead through 4 miles, covered at close to 5min. miling pace. Andy Girling from Glasgow University caught the lead group & he & Brown proceeded to pull clear. By 20 miles, Girling had established a substantial lead. The chasing pack had included John Boyes, running for England, in spite of being Scotland qualified. Boyes closed the gap running along with multi Scottish internationalist Laurie Spence, catching Girling around the 21 mile mark. Boyes, apparently running within himself, pulled away to win comfortably in 2.14.54, some 2min.22sec. inside the course record. Girling was second, 47 sec. back, with Spence finishing third, & first Scot, in 2.16.01 With former winner Jim Dingwall in fifth along with leading veteran Donald Macgregor in tenth, Scotland finished second of seven nations in the team race. Early leader Jim Warwick, who wasn’t a member of any club finished 13th in 2.19.19, almost an hour inside his estimated finishing time! Lorna Irving running in her third marathon, produced a Scottish All-Comers record of 2.37.19 to win the women’s event easily, 8 minutes clear of perennial runner up Leslie Watson, again second in 2.45.24. Third was Central Region AC’s Ann Bates, 2.52.20. 1985: The 1985 race was held on Sunday 22nd September, in persistent heavy rain. Numbers this year saw 11,492 entries, slightly higher than last year’s record. Former GB track internationalist Dave Lowes from Newcastle came out victorious in this year’s event. Having given up the sport for six years due to injury, Lowes, running in his first marathon showed excellent form to win by 23sec. from fellow Englishman Peter Russell with another England representative, Ray Maule from Coventry in third. Lowes hadn’t been included in the England team, but with 2nd 3rd & 4th they still won the team race easily. Loews was among the pace setters from the start, along with Ossie Harris one of the England team. Harris forced the pace until the 15 mile mark, before Lowes pulled clear. The chasing pack included Maule, Harris, Robson, Russell & Mike Carroll. Running for Annan & District, Carroll was the first Scot to finish in 6th., with Donald Macgregor in tenth for the second year, once more the first veteran. In 138th place was former Commonwealth & European champion Ron Hill, completing his 99th marathon. The race was struck by tragedy when Duncan Kerr of Garscube Harriers, on course for a 2.20 time, collapsed & died, less than half a mile from the finish. In spite of intensive efforts by doctors, his heart had stopped & failed to respond to all attempts to resuscitate him. A sad end to this 1985 event. 1986: September 21st. saw this year’s race take place, with, for the first time, a decrease in the number of participants. 3000 fewer than last year, 8210 started. One argument put forward was that “at first people had been caught up in the marathon hysteria, now however, the race was attracting more serious runners”. Starters included a Pink Panther, a Scottish Superman & a hula hoop dancer – possibly a slightly flawed argument? The course record was well & truly beaten by winner Kenny Stuart from England, running in his first marathon. Stuart led through the 5 mile mark; at 10 miles Stuart had Poland’s Konieczny & Robin Nash for company. At 15 miles, Stuart was clear of the field and in a comfortable win, finished almost 4 minutes ahead of Welshman Dic Evans, who finished third in 1983, with Jacek Konieczny third. The winning time was 2.14.04.First Scot was Pitreavie’s Frank Harper, with a new p.b. of 2.18.44 in fourth place. Scotland’s team of Harper, Alan Adams & Murray McNaught were third in the team race with England first & Wales second. Dumbarton’s Adams was the first veteran, in 2.23.03. Sandra Branney, first Scotswoman last year, won the women’s event even more convincingly than Stuart, more than eight minutes clear of Leslie Watson, who once more took the runners up award, together with the first female veterans prize. Kenny Stuart was a remarkable endurance athlete. Best known as a fell runner his record for the Ben Nevis Hill Race, set in 1984 still stands, 27 years later. Incidentally, the women’s course record, set in the same year, was set by his wife Pauline! Kenny also holds the course record for the Snowdon race from 1985 – 26 years on. He later recorded a marathon time of 2.11.36 in the 1989 Houston Marathon. Later that year his career came to a premature end due to persistent allergy problems. 1987: Worrying signs for the race, as `only’ 5516 started, a huge drop off rate from previous years. Lack of television coverage & no main sponsor were cited as possible reasons, 15 minutes of race highlights were shown on BBC late at night as part of a programme covering a snooker tournament. In an effort to increase the quality & quantity of the field, the course was made easier & prize money was on offer for the first time. However, these incentives did not make much of an impact, with again, no TV coverage and the car, a prize for anyone bettering 2hr. 13, remained unclaimed. The men’s race was won By Dublin’s Eamonn Tierney in 2.19.09, the slowest winning time in the race’s history. Second & first Scot was Terry Mitchell of Fife AC, 31sec. back, with Hammy Cox only three seconds behind Mitchell in third. The race was arguably the most competitive in spite of the slower times, with a group of 20 runners together at the 10 mile point, reducing to five at 20 miles. Tierney broke clear at 23 miles, though Mitchell closed the gap two or three times, before finally losing touch with one mile to go. Fast finishing Cox from Greenock Glenpark just failed to catch Mitchell. Tierney picked up £1000.00 for his efforts with Mitchell receiving £750.00. First veteran was Brian Carty of Shettleston in 17th., with a time of 2.25.18. Glasgow, with Bellahouston pair Andy Daly & Billy Robertson, won the inter-city team race & £900.00, from Cardiff in second. A new name in the women’s event with Scot Sheila Catford threatening the course record, winning in 2.37.31, less than half a minute off the best time, which was worth £1000.00 in prize money. 2nd, once more, was Leslie Watson, again first women’s veteran, competing in marathon number 140! Third place went to Penny Rother of Edinburgh AC with a time of 2.54.27. This was the last year in which the race distance was the full 26 miles 385 yards. Undoubtedly the drop off in numbers, together with the lack of sponsorship & television coverage caused the organisers to have a major rethink as to the way forward. In 1988, the race was changed to a half marathon, followed by a 25km event, then back to a half marathon. Coverage of those events will require a separate article. Colin Youngson’s account of the 1983 Glasgow Marathon, as published in the Vets magazine in 2015 is worth a read – just click on his name!